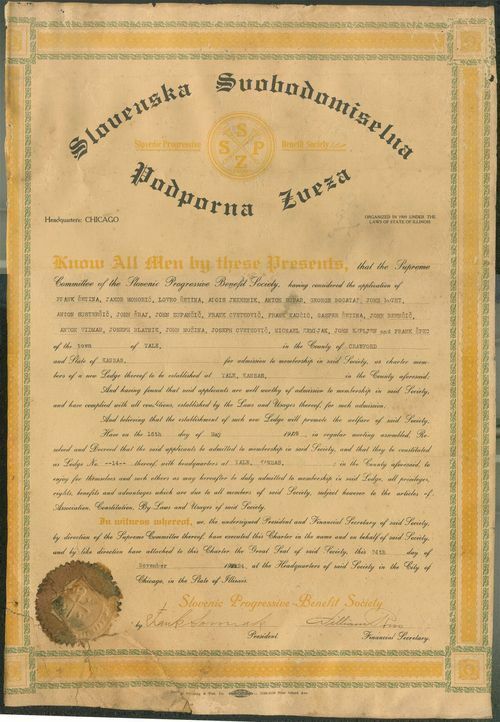 A Slovene Progressive Benefit Society (Slovenska Suobodomiselna Podporna Zueza) charter issued to Lodge no. 14 in Yale, Kansas. The Society merged with the Slovene National Benefit Society (Slovenska Narodna Podporna Jednota) in 1941. The Society offered affordable life insurance to Slovenian immigrants. In the late 1880s and early 1900s, many Slovenians came to American to work in the southeast Kansas coal mines. The Slovene Progressive Benefit Society provided immigrants with social and cultural activities.